Congratualtions... please send me your snail mail addresses so I can mail you your prize! Yesssss... I'm still going to mail it to you... even if you are STILL hanging out at my B&B... check out whenever you like and when you arrive home you will have a PRESENT! If you did not win my Ooh la la Giveaway... don't be discouraged... I will not be discarding the rest of the photos BECAUSE I will be doing a weekly drawing until the end of the year... SOOOOO... you actually get more than 1 chance! AND NEXT WEEK I WILL BE DRAWING ANOTHER WINNER! JUST A REMINDER... Only one photo request per person... so if you wish to change the photo you already sent, please let me know and send me a new photo or link... OTHERWISE... you're still in the running to WIN A SET OF FRAMEABLE NOTECARDS OF YOUR PHOTO that moi "Fifi Flowers" will paint! Here is another option to this giveaway... if you would rather win a set of Fifi Flowers Frameable Notecards of one of my paintings... simply let me know which painting. For those of you who have not entered my Ooh la la Giveaway... Send me a LINK to your favorite photo (only 1 photo please) or an email and don't forget to leave your EMAIL... and I will randomly draw a winner... then I will paint your photo and post it on my blog and YOU WIN A SET OF FRAMEABLE NOTECARDS OF YOUR PAINTING... WHICH WILL BE SENT TO YOU VIA SNAIL MAIL! Deadline for the Ooh la la Giveaway is Friday the 26th midnight PST. THIS IS THE LAST WEEK OF MY OOH LA LA GIVEAWAY... GOOD LUCK! Thank you to EVERYONE who left comments on my post yesterday... I TRULY appreciate your kind words and my heart goes out to all of you who have lost a pet... excuse me... a loved one... merci. Congratulations to the winners. Happy Holidays to you. Just wanted to say, i've just seen your fabulous "red dress" on Karina's blog and love it !! Have a wonderful holiday ! Congratulations to the winners...what a treat! Hi Fifi - Hooray for the lucky winners! 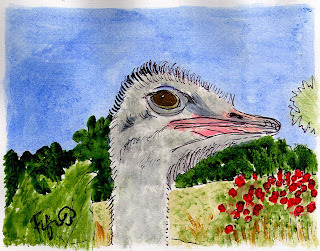 That ostrich is wonderful. xxxooo holiday hugs from Texas! Love the Ostrich. Wonderful painting. Congrats to all the other winners too. You will really enjoy her work as much as I do mine she has done. OMGosh Fifi, not only did I get to stay at the best B&B ever. I now find out that I have also won one of your beautiful paintings, this is turning out to be the best Christmas ever, thank you so much, Mama/Kathy and congratulations to all the other lucky winners. Congratulations to the winners. Thank you for your sweet comment. I'm thankful for our friendship! We are so lucky to have you Fifi in our lives. You share so much of your talented gift. And I am sorry to hear of poor Molly Madison. She is such a sweetheart in her photos. I have only had Alfie a couple years and know how devastated I will be when his time comes. Our pets do become members of our family. Hope your holidays are memorable. Buon Natale!!! All the best!!! Congrats to the new winners! And boy are you gonna LOVE LOVE LOVE the beautiful cards when you see them. So much better in person! Adorable ostrich! Congrats to your lucky winners, and happiest of holidays to you my friend! WOW!!!! You did SUCH an awesome job!!!! Lola (the ostrich) looks lovely!!!! !